Planes, Trains and Automobiles? Is this the Future of Infrastructure in Yorkshire? The Northern Powerhouse is everywhere. It even has its own Minister, seeking to address the North-South divide which is as strong as ever in our post-recession construction economy. However, the government’s focus appears to be rather Manchester-centric, which is all well and good, but many do believe that what is great for Manchester is not necessarily the right thing for Yorkshire and the Humber. So what does this mean? Are we talking about Manchester as a capital of the North, or is it about the North working together, akin to the Northern Way of the Blairite era? Some people argue that the Northern Powerhouse is little more than a concept, but it is a concept that is gaining momentum and encouraging spending across the region. The thing is, Northern cities are disparate. It’s all very well encouraging the cities of Leeds and Manchester to band together and collaborate, but have you ever been on the Transpennine Express at 5.30? It’s all very well encouraging businesses to invest across the region when high speed broadband is still a dream for far too many. We can all agree that whilst London attracts 4 times as much spending on infrastructure, but the North cannot attract the investment it needs when there is a lack of serious infrastructure spending in the region. And many believe that HS2 is not the answer. There are just too many questions. But it finally feels like Westminster is starting to listen and has announced at least £6.4 billion of transport investment in Yorkshire and North Lincolnshire. However, how joined up is this investment? You can make it to Leeds Station, but trying to get to Leeds Bradford Airport is an adventure in itself. Connectivity through infrastructure is critical to the growth and strength of the large geographical area covered by the Yorkshire and Humber Region. But how do we ensure appropriate development in our rail, road, airports and bus transport, as well as sustainable green transport options (including cycling and pedestrian routes)? And has there been enough joined up thinking on integrated transport plans, public transport, effective utilisation of airports and clear consideration as to how region to region connectivity can be improved? This raises a further question. The need for new housing and greater transport links undoubtedly results in a greater demand for public services such as hospitals and schools, but it is debatable as to whether there has been enough investment in this social infrastructure. Centralisation of resources has advantages for both industry and public services but does this have a negative impact on communities with increased traffic, costs, and loss of time travelling long distances for work, schools, and healthcare? Does the high speed internet compensate for this or does it fragment communities and isolate people further? Investment in both these sides of infrastructure is, quite frankly, brilliant, but by the time new roads, trains and HS2 have been delivered, will the needs of the region have moved on? In the same way that we are educating children for jobs that do not exist yet, are we designing infrastructure to serve jobs and lifestyles that have yet to be invented. And if this is the case, is it all a waste of money? Although the internet of things, artificial intelligence and the collaborative economy sound like fringe ideas, the fact that the Chancellor has allocated £40million to the idea reinforces the fact that this is very much the future. But how does this new infrastructure affect the construction industry and the communities we build? How does this affect our homes, our carbon footprint and our future workforce? This in turn raises yet another question. What about the ghosts of infrastructure past? Our roads follow the routes of drovers paths, airports are former RAF bases and railways rattle on Victorian routes. But is it more sustainable to start again, replace what is there or just give up altogether? The impact infrastructure has on the environment, whether we are considering roads, railways, power stations, wind farms, waterworks, heating systems, flood barriers or hospitals, is huge. What are the environmental costs of decommissioning past endeavours? What are the implications of future needs? So, going back to the Northern Powerhouse and the investment in the infrastructure – the economic skeleton, so to speak, of the region, Hull is a brilliant example of how a city can use its backbone to re-invent itself to face the future with a wonderful sense of confidence. Since the 12th century, Hull owes its existence to its port and its prominent position facing Northern Europe. By first exporting monastic wool, the port expanded in response to Yorkshire’s industrial revolution. And when Hull was not exporting Yorkshire’s goods, it was feeding the nation with fish from the North Sea. Automation of shipping and the Cod Wars put paid Hull’s fortunes in the 1970s and by the 1990s it was considered one of the poorest towns in the UK. However, Hull’s ‘old’ infrastructure is having a rebirth, with the port city becoming the centre for green industries, energy imports and remains a key gateway to Europe. Can such a rebirth be a lesson to other post-industrial cities of the North and what does this mean to Yorkshire? I realise that I have piled question upon question, but at the Construction Industry Council, we believe that it is necessary to encourage a debate and pose questions that get us all thinking. 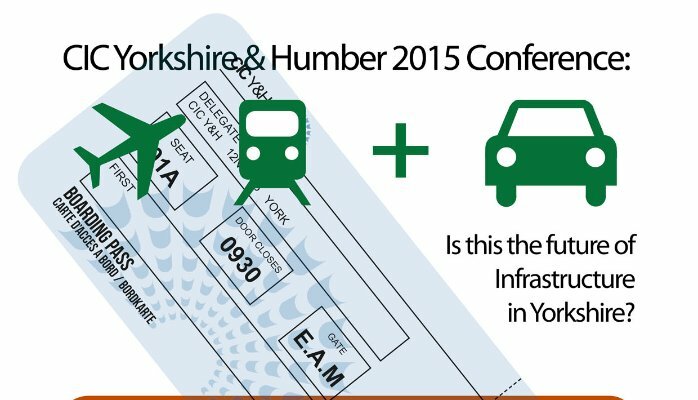 Come join us at our fifth annual conference on the 12th November at the Yorkshire Air Museum to explore these questions with a range of experts and – hopefully – come out a bit more informed about what infrastructure investment means to Yorkshire and the Humber. I look forward to seeing you there amongst the planes of the Yorkshire Air Museum.